Mode of occurrence: Ovoid pebbles and cobbles. Cortex: Rolled neo-cortex, smooth and thin (<1 mm), grey, transition sharp. Colour: Grey (N5) with indistinct darker grey or light tan patches. Pattern: Basically featureless, a few specks and spots. 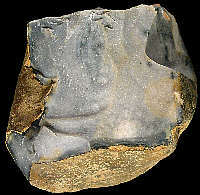 Appearance: Homogeneous material, dull and opaque, moderately smooth and quite dry, medium-grained. Grains: 20 %, pale, micritized, high sphericity, contained between 100 and 500 µ. Grain composition: Numerous globose planktonic foraminifera (e.g. Hedbergella sp. 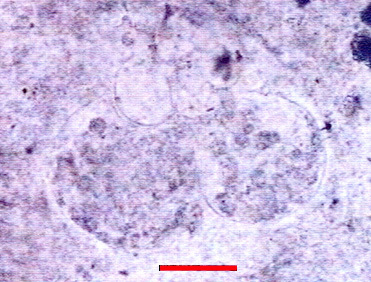 of 500 µ), whole or fragmented (discrete chambers of 100-120 µ), very rare biserial Heterohelicidae, a Lenticulinea, a few thick-walled monaxon sponge spicules. 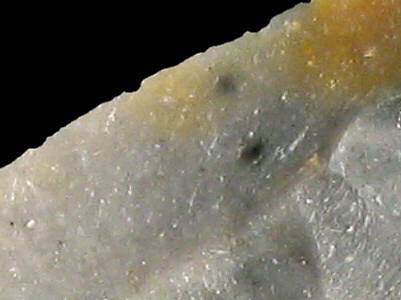 Other types of flint: The flint here constitutes quite a mixed lot, with predominantly Late Cretaceous material like CE1a, CE1b, CE2, CE3, CE4a, CE4b, and CE5, but also Hauterivian (Early Cretaceous) material of the Ht3-type.